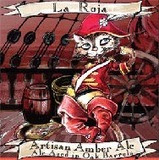 La Roja, an artisan amber ale brewed in the Flanders tradition. Deep amber with earthy caramel, spice and sour fruit notes developed through natural barrel aging. Unfiltered, unpasteurized and blended from barrels ranging in age between two and ten months. Truly an ale of distinction.